This article is a short summary of Mario Party 5. Mario Party 5 is a video game released for the Nintendo GameCube in 2003. 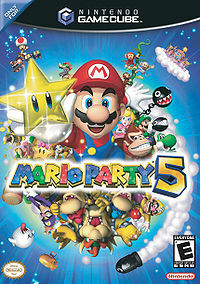 It is the the fifth game in the Mario Party series and the second to be released on the GameCube. The superstars of the Mushroom Kingdom are partying again! Grab your friends and join in the madness as you battle across all-new game boards in a race to collect the most stars. Brand-new minigames, including one-on-one duels and everyone-vs.-Bowser brawls, as well as mini-game tournaments, a decathlon event, and much more make this a party you just can't miss!" In the night sky, past the moon and beyond the stars, there's a dream world known as Dream Depot, where everyone's dreams come together. This is the real land of dreams... In this land, there are Star Guards who protect the dreams of everyone. One dreamy night, the Star Guards thought of something. "Many dreams arrive here at Dream Depot every day," they said, "so... why don't we offer those with the power of dreaming a chance to visit?" Eventually, they decided to invite Mario and his closest friends because, when it comes to dreamers, nobody dreams bigger than they do! The Star Guards prepared for their guests' arrival by creating many fun-filled games for them to play. And that is how this adventure for Mario and his friends both old and new began! In Story Mode, Bowser and Koopa Kid are planning to ruin everyone's dreams, and players must stop Bowser from taking over said dreams. If players clear the five boards, they must face the Koopa Kids in Bowser Nightmare, and if they beat that board, they fight Bowser in Frightmare. This page was last edited on 8 September 2017, at 01:45.